How good of a friend are you? What would you be willing to do for your friends? Come meet some very good friends who helped a paralyzed man meet Jesus. When Jesus was in Capernaum, so many people came to the house where he was staying that there was no room left inside or even outside the door. Not too far away, in another house, five friends were talking. Have you heard the news? Jesus is here. He is here in Capernaum. Oh, how I would love to see Him, I can't walk, but you all should go. Leave me here and go see Him. I won't mind. You can tell me all about it when you get back. Go, see Jesus. No, I have a better idea. I've heard that Jesus can heal people-blind people, deaf people--even people like you who can't walk. I think we should all go to see Jesus and ask Him to heal your legs. But how will I get to Jesus? Easy. There are four of us, and we are strong. We will carry you on your mat. Let's do it! 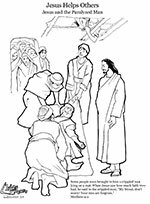 So the four friends carried their paralyzed friend to the house where Jesus was preaching. But they were in for a surprise. Look at all these people here to see Jesus. I can't even see Him. We've got to get close to Jesus. Let's try the roof. Now what? We still can't see Him. I know. Let's cut a hole through the roof and lower our friend into the room on his mat. Then Jesus will be sure to see him. That sounds good. Let's try it. Okay, the hole looks big enough now. We did it! Excuse us, Jesus? There were so many people that we couldn't get through the door. So, we cut a hole in the roof and lowered our friend down to you. Please help us, Jesus. Please, Jesus, we know that you heal people. That is why we have brought our friend to you. Please heal his legs so he can walk. I am pleased with your faith. My son, your sins are forgiven. When the religious leaders heard what Jesus said, they became very angry. (angry whispering) What? This man says He can forgive sins. How dare He say that! No one can forgive sins but God. Who does He think He is? But Jesus knew what they were thinking. Why are you thinking such things? Which is easier -- to say to a paralyzed man, 'Your sins are forgiven,' or to say 'Get up, take your mat, and walk'? But to prove to you that the Son of Man has authority on earth to forgive sins -- Young man, I tell you, get up, take your mat, and go home. Look, I can stand! I can walk! Jesus has healed my legs. Thank you so much, Jesus! The friends were so happy that they had come to see Jesus. Their paralyzed friend was healed and they could all tell others what Jesus had done for them. If you want to read more about Jesus, read the book of Luke in the New Testament part of your Bible.